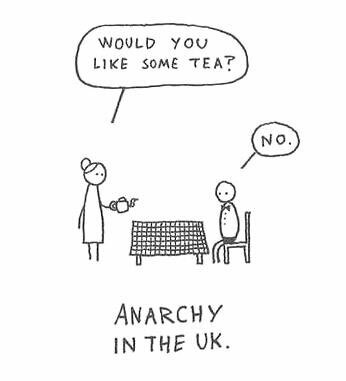 A satirical look at anarchy in the UK: a woman, perhaps a mother, offers to pour a man, perhaps her son, a cup of tea. But, in a clear sign of anarchy, he says no. Created about 7 yrs, 5 mths ago (November 9, 2011). Updated about 7 yrs, 4 mths ago (November 30, 2011).